A celebration event was held at Bradford City Hall this week to highlight the brilliant work of the Bradford Literacy Champions, who are volunteers who have been working to improve literacy in their local communities through a variety of projects. Since November, the Bradford Stories team have been training up the Literacy Champions and working with them to help them deliver their projects. In attendance at the event were secondary school students from Beckfoot Upper Heaton who have been supporting younger pupils to read, mums from a group at Girlington Primary who had set up their own community reading groups, and a cricket club dads’ group who set up their own library spaces and are encouraging writing for enjoyment. 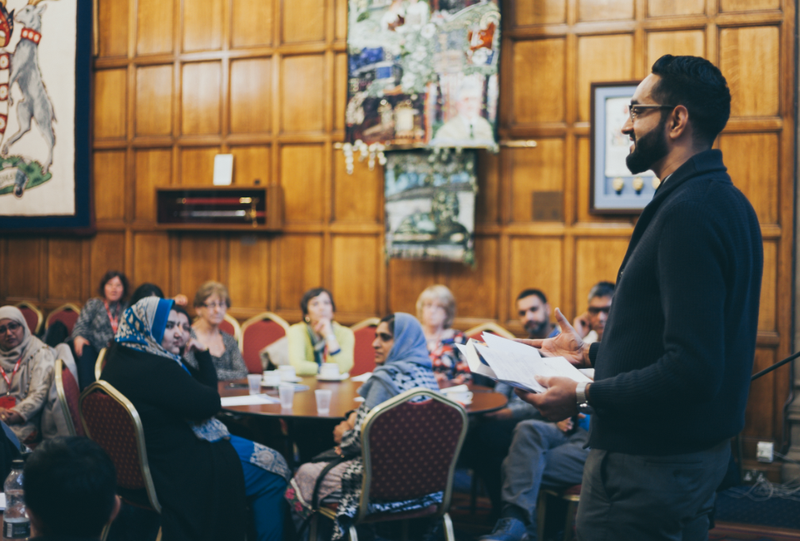 Also in attendance at the event were organisations including NEESIE and Incommunities who worked with the Bradford Stories team to recruit Literacy Champions from a variety of different communities. Representatives from the Morrisons Foundation, who have funded the Hub in Bradford over the past year, were also at the event, along with National Literacy Trust Director Jonathan Douglas. The Literacy Champions were presented with certificates and prizes to celebrate their work, including vouchers for local restaurant and Bradford Stories partner MyLahore. The Literacy Champions project has been such a success in Bradford that it is now being rolled out across other National Literacy Trust Hub areas, including our latest Hub on the North Yorkshire Coast.